Cats scratch for two reasons; to keep their claws in good condition and as a communication signal. A scratching post provides exercise for your cat and allows them to maintain their claws. Our Mansfield Adoption Centre was donated these great homemade scratching posts which has inspired this blog post. You need something heavy which can be used as the base (the post photographed uses a compact grade laminate tile). The base should be strong enough so that your cat can lean against it without it wobbling. You also need a tall, sturdy log or cylindrical wood offcut to use as the post. Make sure the wood is safe for cats and hasn’t had any treatments or varnish. The post should be at least 60cm tall so that the cat can fully stretch. Securely screw the post into the base. 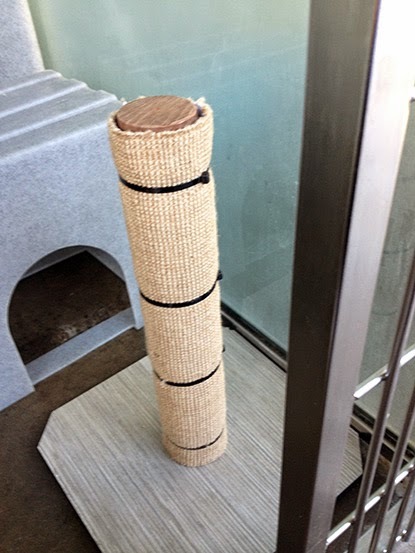 Cover the post with a scratching material – carpet samples or offcuts should be just fine. Make sure you position the carpet so the thread is vertical, allowing the cat to scratch downwards. Attach using cable ties. Cats like to stretch and scratch after they wake up so try placing the scratching post near to where they sleep! If you like this, why not check out our blog posts on how to make a cat tent from a t-shirt or how to make cat-shaped healthy biscuits?